Formosa (福爾摩沙) / Taiwan, is the area based on Taiwanese culture. It, like Japan, is made up of three main areas, Ximending, Night Market and Taipei 101. The word "Formosa", is a name the Portuguese gave to Taiwan, which translates to the word "Beautiful". Roads: Formosa (TaiwanMSS) and Taiwan (JapanMS). Map of the Formosa region. This is the first area that one arrives at when traveling to Formosa. It has a modern appearance and features a plethora of items and shops. Ximending (西門町) is based on a popular shopping area located in the actual Taipei, and anyone familiar with the real town should find this area strangely familiar. 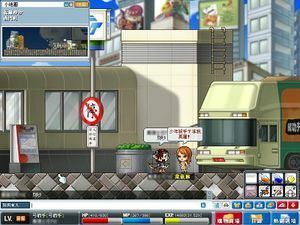 A visiting player emerges from the subways into a vibrant and active city. There are quests from the NPCs here, some of which are based on real celebrities in Taiwan. It is a bright place, filled with apartment buildings and different types of cars, including large cargo trucks and smaller personal vehicles. Giant billboards like those found in Times Square or any contemporary city can be found. Even the minimap icon shows its modern state by depicting traffic signs. The monsters are found in alleyways, and range from stray city dogs to Lupins riding motorcycles and unicycles. By entering a portal on top of a building just before the Motorcycle Lupins. Ximending can be reached as part of the World Tour through Spinel the Tour Guide (KoreaMS, JapanMS, TaiwanMS, ThailandMS), through a Subway Line that departs from Kerning City (TaiwanMS), Or by the Perry the Pelican Taxi in Mushroom Shrine (TaiwanMS). Roads: Formosa (TaiwanMS) and Taiwan (JapanMS). This area is unique because it is set at night time, like Korean Folk Town's Black Mountain,Zipangu's Mushroom Shrine Cemetery and Magatia. Night Market is Based on the city of Taipei itself. The Taipei 101 tower can be seen in the background reading, 1<31 instead of 101. Lanterns are strung across the streets, lighting the path. There are hair salons and a plastic surgery hospital here. There are numerous stands, like food vendors and toy sellers, all across the town. Many NPCs are located here, and hand out quests, in addition to selling various items exclusively available here. The music in the town has a similar tune to that of the music of the Town of Mu Lung, but fast and anxious once one leaves the area. Monsters here are very strange, including animated Milk Tea drinks and vending machines. Further down the monster trail, transforming crane machines that summon miniature toy monsters are found, and the big boss of Formosa, the Snack Bar, is located. It has two forms and drops the always valuable Ilbi Throwing stars. 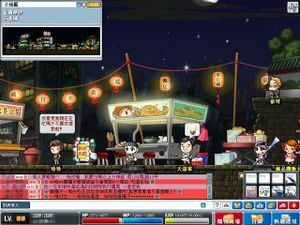 In TaiwanMS, In the month of December 2006, it was joined by the Christmas King Slime, which randomly appeared in Night Market maps. Also in TaiwanMS, there is a Fish Catching mini game called Fishing King, involving swimming through an Aqua Road-like setting and melee striking different kinds of fish. This page was last edited on 5 February 2019, at 13:15. This page has been accessed 71,411 times.